Uplogix Local Management Software version 5.2 makes out-of-band easier, faster and more valuable with WAN Traffic Failover (WTF) – a backup path for the primary network that doesn’t require expensive redundant gear. The update includes new functionality that pairs high-speed LTE modems with the network-independent monitoring and device automation of the Uplogix platform to failover WAN traffic during an outage. This keeps users up and running while providing admins in the NOC with remote visibility and tools for resolving issues. As more business applications move to the Cloud, network uptime is increasingly critical. WAN Traffic Failover (WTF) from Uplogix ensures that if the wide area network goes down, users aren’t left sitting idle. An Uplogix Local Manager (LM) will detect the outage and bring up an LTE connection to pass the router traffic, allowing services at the site to continue working. In parallel, the LM can push an alert to the NOC that automatically creates a trouble ticket, cutting the time to awareness of the issue. Staff at the NOC can utilize the LM’s local connections to devices to monitor the situation remotely, including service levels, and take other remote actions if needed. If the primary path returns, Uplogix can automatically restore the infrastructure to its initial configuration and notify the NOC. 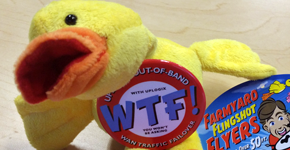 WAN Traffic Failover (WTF) made its debut at Cisco Live 2015 in San Diego, along with the Uplogix WTF Duck. The v5.2 release also introduces support for high-speed LTE cellular modems certified for both the AT&T and Verizon networks. With the new release, multiple LMs in the same facility can share a single out-of-band channel, reducing costs and simplifying deployments that require multiple LMs. A new out-of-band wizard simplifies the initial configuration of an OOB connection whether that link is over cellular, a POTS line, fiber or satellite. The release includes numerous usability improvements to the Uplogix Control Center including a more graphical, device-centric representation of an Uplogix deployment. From the Control Center, users can see all of their LMs and the devices they are managing over both physical and virtual console connections. The v5.2 software will ship on all new Local Managers and the Uplogix Control Center. For more information and customers wishing to upgrade, visit Uplogix support at uplogix.com/support. How many comatose servers do you have? Putting air bags in a 1965 Mustang?